time table/ Date Sheet, exam timings and other details at CISC Board official website @ http://www.cisce.org/. 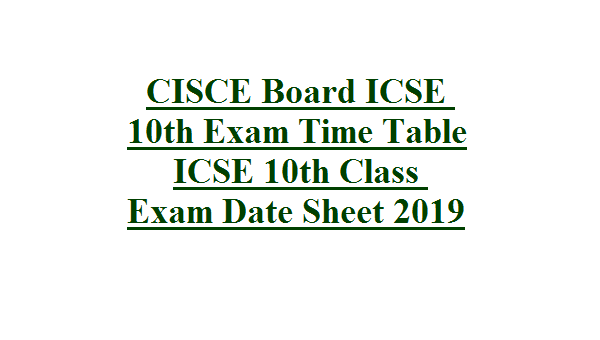 The CISCE Board ICSE 10th class Date Sheet 2019 will be available in PDF format. CISCE board has given notification of ICSE 10th class Exam routine 2019 only for regular students. Private students are not permitted to attend for this examination. ICSE class 10th examination will starts from 22 February 2019 and closed on 25-March-2019. 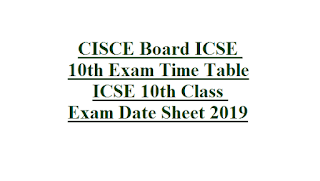 For more details like Exam syllabus, Exam date & time of CISCE (Council for the Indian School Certificate Examination) Board ICSE 10th time table 2019 are given below. Organization Name: CISCE (Council for the Indian School Certificate Examination) Board. X Class Exams Starting Date: 22-February-2019. Last Date of ICSE 10th Class Examination: 25-March-2019. ICSE Indian Certificate of Secondary Education Annual Exams will be conducted in the months of February and March. First paper English Language will starts on 23-February-2019. The board of CISCE will hold last paper on 25-March-2019. The duration of the exam will be 2hrs to 3 hrs depending on the subject. For syllabus details students are advised to visit ICSE Regulations and Syllabus page at CISCE official website. Students should appear to the Exam Hall before the given time. The question paper will be distributed before 15 minutes to the time indicated on the Timetable. Check the timings, Date, Syllabus of 10th Exam Date Sheet 2019 available at CISCE website in PDF format. Download the Timetable and start studying with perfect planning. For latest updates Logon to the official web portal of ICSE board.